Acosta’s traumatic experience was similar to other cases Rosenfeld witnessed — cases that showed a disturbing pattern of subjecting women, especially Spanish-speaking women, to sterilization without their informed consent. According to Rosenfeld, insistent medical staff would push sterilization on patients “before they go home” — often while they were still in pain or exhausted — so that they wouldn’t “change their mind by the time they come back to clinic.” Patients who had limited understanding of English were often uncertain of what was happening. Shocked by the unethical practices, Rosenfeld secretly copied hundreds of medical records to document what was happening at USC-LAC Medical Center. Rosenfeld and a colleague eventually prepared and submitted a report to the American Hospital Association. As evidence that the hospital’s sterilization rates had far surpassed what most would consider routine, they noted that the USC-LAC Medical Center had seen dramatic increases in sterilization procedures from 1968 to 1970. Hysterectomies, the surgical removal of the uterus, had increased by 742 percent. Tubal ligation, a procedure that closes or blocks the fallopian tubes, had increased by 470 percent. At the head of Rosenfeld’s department was Dr. Edward James Quilligan, who had recruited and trained many of its physicians after the hospital brought him on board in 1969. At the time of his arrival, the obstetrics and gynecology staff handled 15,000 deliveries annually. Los Angeles, once a modest city of 100,000 people at the beginning of the 1900s, became a center of rapid population growth after World War II. By 1960, its metropolitan area had topped Chicago’s, becoming the second-most populated in the United States, surpassed only by the New York City metro area. The 1960s were a decade of peak population growth for L.A., when its numbers swelled by 1.7 million. They were also the decade that the state of California eclipsed New York as the most populous in the Union. It was in the midst of this growth that Paul Ehrlich, after earning his doctorate in the largely rural state of Kansas, moved to the bustling Golden State to join the faculty at Stanford University. A biologist by training, by the end of the 1960s, he would become one of the most well-known advocates for population control after the publication of his 1968 bestseller The Population Bomb, a book that predicted mass starvation and deaths by the millions as a result of unchecked birth rates. In his introduction, Ehrlich recounted his experience in a crowded Delhi street, where squalor and desperation were ubiquitous and he felt overwhelmed by “People, people, people, people.” The experience, he explained, served as his wake-up call to the threat of overpopulation. Whether intentional or not, the anecdote served as a dog whistle, stirring racist resentment of non-white fertility. Ehrlich’s book fueled an ideology that viewed overpopulation as a looming national threat. In the next decade, partially in response to lobbying efforts by population control advocates, Congress began backing programs to promote birth control, allocating funds under the 1970 Family Planning and Population Research Act, as well as Lyndon Johnson’s 1964 War on Poverty legislation. It also lifted a ban on federal funding for sterilization. Karen Benker, who was a medical student at the University of Southern California from 1967 to 1971, did rotations in Quilligan’s department and later recounted how a senior physician shared the “wonderful” news that they had secured “a big federal grant to cut the birthrate of the black and Mexican population.” As an obstetric technician, Benker worked night shifts in the delivery room, an experience that, like Rosenfeld’s, she started to find unsettling. She alleged that another resident had threatened to deny painkillers to a patient unless she signed a consent form for sterilization. “It was barbaric,” she recalled. 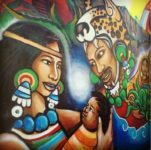 Attempting to put an end to sterilization abuse at the USC-LAC Medical Center, Rosenfeld had gone to hospital authorities, the media, and civil rights groups, all with little success. Finally, he approached a group of Mexican-American lawyers who agreed to take on the cause in a class-action lawsuit against the USC-LAC Medical Center, as well as state and federal governments. Antonia Hernández, who was then a recent law school graduate, took on the case with Charles Navarette as co-counsel. Hernández set about contacting the patients whose sterilizations were documented in the medical records Rosenfeld had collected. Many of the women she met did not even know they had been sterilized until she showed them their hospital paperwork. 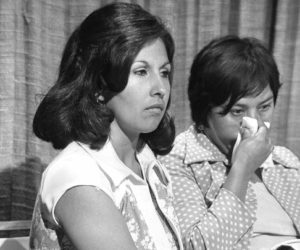 Community spokesperson Gloria Molina and plaintiff Dolores Madrigal, June 19, 1975. Photo: Los Angeles Times Photographic Archives (Collection 1429). UCLA Library Special Collections, Charles E. Young Research Library, UCLA. Eventually 10 plaintiffs agreed to participate in the class-action suit, with Dolores Madrigal as the lead plaintiff. Like Acosta, Madrigal had been admitted to the USC-LAC Medical Center in 1973. While she was in labor with her second child, she was presented with a consent form for sterilization. Since Spanish was her primary language, she was uncertain what the English-language form detailed, but she said she was falsely informed that her husband had already agreed to the procedure. She was also given assurances that the operation could easily be reversed. Only later, after the operation was completed, was she informed that it was irreversible. Quilligan was named as the lead defendant in the case, along with the USC-LAC Medical Center’s executive director, a staff physician, and key officials from the Health and Welfare Agency of California, the California Department of Health, and the U.S. Department of Health, Education, and Welfare. Madrigal v. Quilligan focused on the question of whether the USC-LAC Medical Center had performed sterilizations without patients’ informed consent and whether it had specifically singled out Latina patients. The case made what The Washington Post described as “novel use” of Roe v. Wade, which had been decided in 1973, the same year that many of the Madrigal plaintiffs had undergone sterilization. Though Roe was a case about the right to abortion, Hernández and Navarette argued that its protections covered a range of reproductive freedoms, including the right to have children. They sought both monetary compensation for their clients and changes to federal guidelines to protect women from involuntary sterilization. Madrigal was decided several days later, on June 8, 1978. In spite of the considerable evidence against them, Judge Jesse W. Curtis decided in favor of the defendants, arguing that although people “can sympathize with [the plaintiffs] for their inability to communicate clearly,” it was not malice but an unfortunate consequence of language and “cultural differences” that had resulted in the unwanted sterilizations at the USC-LAC Medical Center. Curtis’ decision absolved the physicians of “legal and moral responsibility for their actions,” but outside the courtroom, the plaintiffs won. In response to the considerable media attention the case had drawn, the California Department of Health reevaluated its sterilization guidelines and ensured patients would receive materials in both English and Spanish, as well as a 72-hour period between consent and the performance of a sterilization procedure. In addition, the publicity pushed the federal government to enforce its own safeguards against sterilization abuse. Madrigal v. Quilligan also expanded the conversation about reproductive justice in the years after Roe, helping to solidify an understanding that just as the right to access birth control and abortion should be defended, so should the right to have children — because not everyone could take that right for granted. The 10 plaintiffs in Madrigal in many ways represented countless other women of color who had been subjected to sterilization abuse — women like the mother of Alice Tanabe Nehira, who was sterilized against her will during Japanese internment in the 1940s, or Norma Jean Serena, who was one of the many Native American women caught in a surge of coerced sterilizations in the 1970s over concerns about welfare-dependent children. Likewise, government sterilization efforts targeted black and Puerto Rican women throughout much of the 20th century. In that sense, Madrigal brought a new sense of intersectionality to the fight for reproductive justice, one that highlighted its links to racial justice. This entry was posted in History, Pregnancy & Parenthood, Racial Justice and tagged abortion, Alice Tanabe Nehira, American Hospital Association, Antonia Hernández, Benjamin Lewis, Bernard Rosenfeld, Black, California, Chicago, Delhi, Department of Health, Dolores Madrigal, Ebony, Edward James Quilligan, English, fallopian tubes, Family Planning and Population Research Act, fertility, Gloria Molina, Golden State, Guadalupe Acosta, gynecology, Health and Welfare Agency, hysterectomies, informed consent, internment, intersectionality, Japanese, Jesse W. Curtis, Kansas, Karen Benker, L.A., L.A. County, Los Angeles, Lyndon Johnson, Madrigal v. Quilligan, Mexican, Mexican-American, Native American, New York City, Norma Jean Serena, obstetrics, overpopulation, Paul Ehrlich, Planned Parenthood, Puerto Rican, reproductive freedom, reproductive justice, Richard Navarette, Roe v. Wade, Spanish, Stanford University, starvation, sterilization, The Population Bomb, tubal ligation, United States, United States District Court for the Central District of California, University of Southern California, University of Southern California - Los Angeles County Medical Center, USC-LAC Medical Center, uterus, War on Poverty, Washington Post, welfare, World War II by Matt. Bookmark the permalink. Thanks for this Matt. We do have to remember that reproductive justice includes the right to decide whether and when to have children, and that includes the right to have children. Another aspect of this issue is making welfare rules that don’t raise a family’s benefit when another child is born, and California led the way on that fight as well.